What is behind Trump’s attack? “You see what happened last night in Sweden.? Sweden!…Who could believe it? 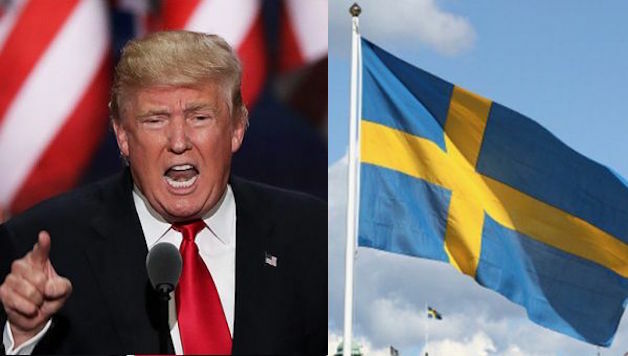 Sweden.” Those comments in typical Trump style, made in a speech in Melbourne, Florida, Friday 10 February, have caused a worldwide debate. It was not a mistake, but a conscious mentioning of Sweden by Donald Trump. In the following sentence, he said: “Sweden! They took in large numbers”. The purpose was to support his wall and travel ban, pointing at refugees and muslims as criminal. Trump’s “Sweden!” came when he was – again – referring to the brutal terrorist attacks in Nice, Brussels and elsewhere. The reason he added Sweden is that it’s well known that more refugees have arrived in Sweden than for example France or Belgium. The Swedish racists, trying to back him up, write that “our first suicide attack on Swedish ground” took place in December 2010. The incident was, in fact, an Iraqi-born man – a Swedish citizen – who killed himself in a failed bombing attempt in central Stockholm. That kind of attempt, more than six years ago, has not been repeated since. In the Autumn of 2015, an extremely high profile police hunt for a “refugee terrorist” ended with the the state security forces admitting it was a mistake. However, there have been several terrorist attacks since then – by racists and fascists. In October 2015, Anton Lundin Pettersson killed three people in a school in Trollhättan with a sword and a knife. He was a fan of Hitler and his stated aim was to “kill as many foreigners as possible”. Over the last two years, more than 50 attacks – mainly arson – have targeted refugee hostels. In Gothenburg, three fascists have recently been arrested for bomb attacks, including against a trade union centre. In 2015, there was also an arson attack against the apartments of members of Rättvisepartiet Socialisterna (CWI Sweden). With Donald Trump primitive right-wing populism and racism are personified in the presidency of the world’s leading state. The background of Trump’s “Brain” – Steve Bannon – in Breitbart is well-known. In the debates over Sweden, many Trump supporters have referred to the Gatestone Institute, a notorious islamophobic lobby group. One of them is “Fjordman”, the ideological guru of the Norwegian fascist terrorist, Anders Behring Breivik. Trump is a president who seems to act unpredictably, but with far right advisors and a conscious reactionary plan. Nationalism – America First – is an important part of the programme. The costs in terms of deteriorating relations and reduced trade are supposed to be offset by the feeling that Trump is fixing something that has gone wrong. In addition, this encourages politicians in other countries to pursue a similar line. Even Sweden’s former conservative prime and foreign minister, Carl Bildt, exclaimed, “What’s he smoking!”. He commented that Orange County, Florida, where Trump held his speech, has 50 percent more murders than Sweden as a whole. It has just 1.25 million inhabitants compared to Sweden’s 10 million. In 1980, Sweden was the most equal country in the world. In November last year, however, the new list of Swedish billionaires was presented. (One billion Swedish krona is 100 million euros or dollars). 178 people own 2,000 billion krona, which is equivalent to double the state budget and half the GDP! The two wealthiest individuals own more than the poorest half of the population – 5 million people. In fact, Sweden has more dollar billionaires per capita than the US!